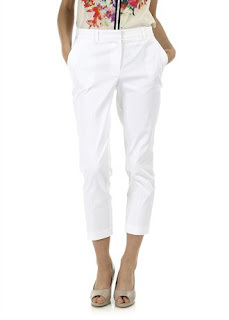 Day 2 and I'll be flying out to France today in my next summer must have today - the white trouser. I would recommend a cropped pair and a skinny pair...here are my picks of both..
Good old Tesco first. 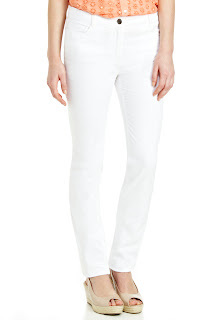 White jeans/trousers are not the easiest to keep so I'd not spend too much on your day to day pair. These are just £14 and will earn you clubcard points too! Watch out for special offers on F&F - often appear online at weekends. A bit of a mix of both styles in these ones from M&S - the 5 pocket cropped denim jeans. Only £19.50 and look like a lovely fit on the waist. I cannot get enough of white in the summer - however we have yet to have a summer (I don't count 3 days the other week as 'summer')! Roll on proper summer so I can get wear out of mine! Dug my white baxter jeans or ready over the weekend! I have dug out my baxters like Hollie too, I love white jeans- they instantly brighten up any outfit! I bought a pair last summer and wore them once, have vowed to get them on more this year.